There was a king who had a pet monkey. The monkey was very close to the king and was always seen with the king. The monkey also did various chores for the king. One day, the king was taking the afternoon nap. As it was the summer season, so the monkey was fanning by his side. Suddenly, the monkey saw a fly sitting on the king’s face. The monkey tried to shoo the fly away. The fly was stubborn as it resturned again and again to diturb the sleep. Monkey tried to wave his fan to scare the fly but it was of no use. Then the monkey picked up a sword as he wanted to kill the fly. 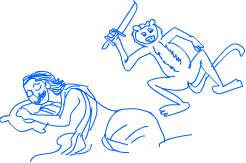 The monkey attacked the fly with the sword but the fly flew away and the poor king was killed instantly.